Word came across the pond today that stiff-upper-lipped Economist.com plans to acquire half a million Facebook fans in the next six months. Publisher Ben Edwards told The Financial Times that making The Economist more social is “the core of our strategy.” What gives? 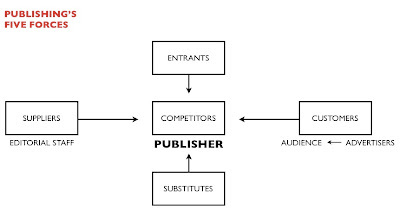 Publishing thrived in this model nicely, with the nuance that it really served two sets of customers, the audience who watched TV or read the magazines and the advertisers who in turn chased that audience. Since advertisers fund 90% of any publishing venture (subscription fees are but a pittance), the size of the audience was paramount. 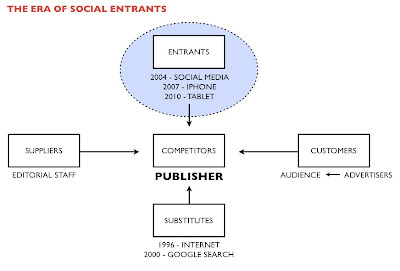 And then, in the late 1990s, the Internet and Google reared their heads … and audiences began to move south. 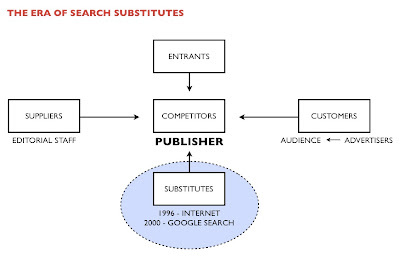 This second act of the publishing era gave us the Andersonian Long Tail, or what we call “The Era of Search Substitutes”: readers rushing from paid subscriptions to millions of free web sites, anything you desire found via Google.com. Because audiences were so vital, publishers gave away a portion of their wares online for free in hopes of luring readers back, opening a Pandora’s box of declining print circulation and ad revenue. And then in the past two years, audiences moved again — to Act 3, “The Era of Social Entrants.” What at first seemed online games for flirting teenagers became tools attracting millions of users, who could follow breaking news inside Twitter faster than CNN and network professionally with thousands of new contacts without the onerous ping-pong of email. The iPhone, the first portable device with easy Internet access, pushed the trend, and next year both Apple and Dell are set to release larger-screen mobile tablets that will take portable interactivity further. Can publishers rebuild subscriptions in a new sharing world? Once again, publishers face a threat, but there is also hope of more control … since marquee brands can sound their own voices in social media forums. Tablets are being eyed especially closely, since they provide a narrow window for publishers to improve their content in exchange for new paying subscribers. (See this Sports Illustrated tablet demo for a sneak preview at their tempting tablet layouts.) The trick will be to move beyond gimmicks to give users some skin in the game; The Economist, for instance, will encourage commenting inside Facebook and Twitter by building a new Economist.com “reputation system,” similar to the rank-scoring mechanisms of “follower counts” that make Twitter so popular. Since social propagation can’t be controlled and requires constant experimentation — there is a Talebesque randomness to the fads that “go viral” — The Economist is making managing its social media presence a full-time job. Major retailers are moving this way, too: Pepsi just announced it is skipping SuperBowl advertising in 2010 to instead drop $20 million on social media experiments, and Amazon.com now provides widgets helping bloggers link its online products for a cut of the sale. The Financial Times notes “broadcasters … are finding that mingling with the huge audiences gathering on Twitter and Facebook can be a source of traffic to rival that of search engines.” Perhaps this is a wake-up call for your business, if you’re still focused solely on your advertising, web site, or search presence. What are you doing to attract the rising crowds in the social entrant space?